One person, one ship – and even odds on returning home. 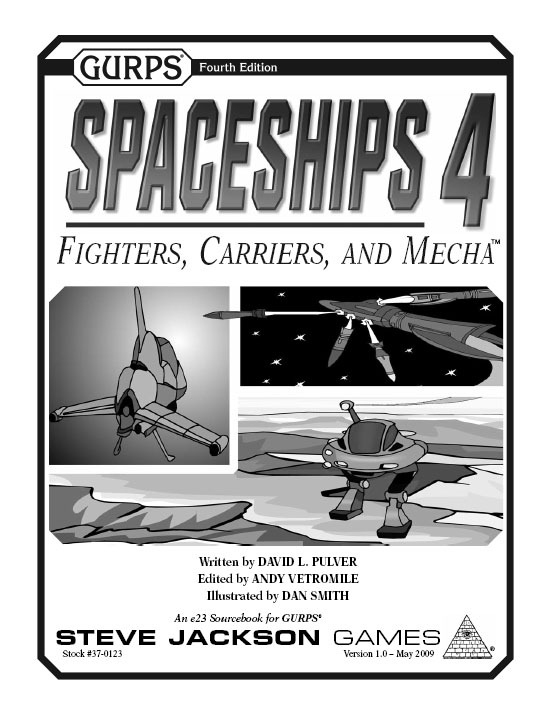 GURPS Spaceships 4: Fighters, Carriers, and Mecha provides the ships and game mechanics needed for space-fighter and carrier action. It offers GURPS Spaceships statistics and descriptions for dozens of combat spaceships for the near-future and beyond, from tiny-but-agile fighters and drop ships to enormous fleet and assault carriers. It also includes expanded rules for the basic space-combat system in GURPS Spaceships, adding options that simulate small-ship cinematic action. It's up-close and personal in heated space combat, with two combatants each wanting the other dead . . . and if they're not cunning and careful, they could both get what they want. GURPS Spaceships and its supplements – The long-awaited companions to GURPS Space, presenting rules for TL7-12 spacecraft, from tiny lifeboats to giant dreadnoughts. 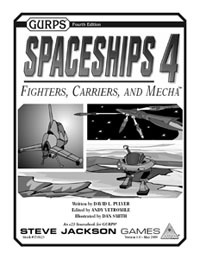 The main book covers spaceship design, travel, and operations, along with a (mapless) space combat system. Other volumes in the series expand on the core for more possibilities!